Hydraulic systems jerk and pull the metal train cab back and forth as the driver pilots it along the tracks of Berlin's commuter rail system, as images of the city just after the fall of the Berlin Wall whiz by. 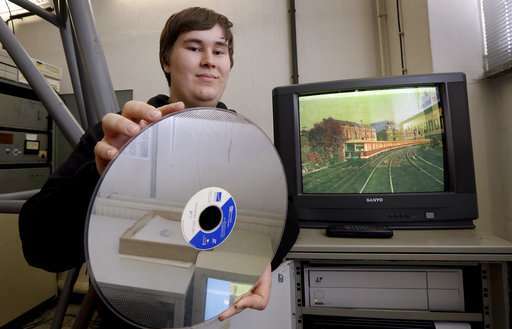 Completed in communist East Germany in 1968, the one-of-a-kind train simulator had its last major overhaul nearly 30 years ago when it was outfitted with then-state of the art equipment—its 16mm film screen replaced with LaserDisc technology and a Commodore Amiga 3000 computer installed to run the system. 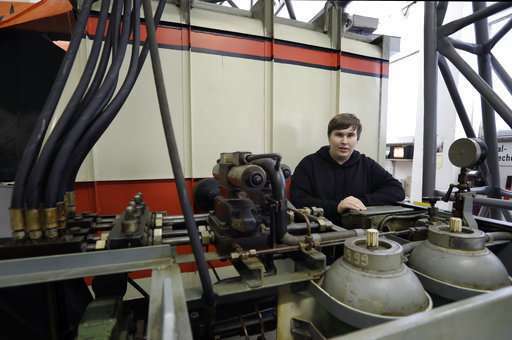 Not surprisingly, those systems today are breaking down more and more frequently, and volunteers who have kept the unit running in a museum in an industrial building on the eastern outskirts of the German capital are now trying to raise the funds to save it. 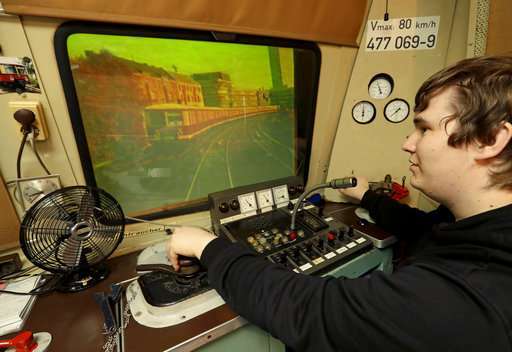 "It has quite a historical importance," said Lutz Tannigel, the last teacher to use the simulator to test train drivers. 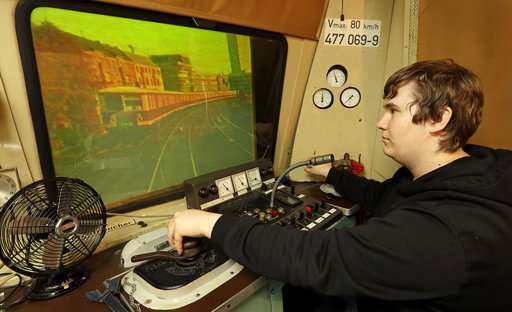 "It was the first simulator that the Deutsche Reichsbahn (East German national railway) had. And we still have it and it still works, so it is absolutely imperative to maintain it for the future." 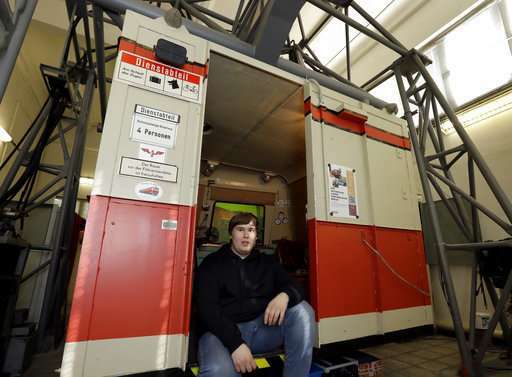 Built in the city of Halle, northwest of Leipzig, it was a sort of early virtual reality experience that was used to teach train drivers to deal with unexpected emergencies such as the loss of break pressure or an electrical fault. Air is pressurized by an electric engine for the brake system. The cylinders move the train cab noisily forward and backward, left and right to mimic the movements of a real train on a track. And, it occasionally lets off an alarm. "This was a huge innovation back then in the 1960s," said Tannigel, an energetic 54-year old who still works as a teacher for train drivers in Berlin. "That you could use a simulator to train drivers. That was very advanced." 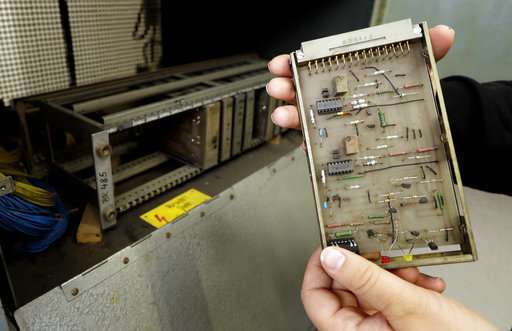 East German train authorities commissioned the unit from their research and development unit in Halle after visiting a train simulator in Britain produced by General Precision Systems. After testing, it was put into use in 1969 for the training of locomotive drivers. Thousands of drivers were trained on the machine, which in those days used 16mm film on a screen. The cabin was set up like a diesel locomotive from the Deutsche Reichsbahn. In 1988, it was moved to Berlin and refitted to match the city's local "S-Bahn" commuter train service. 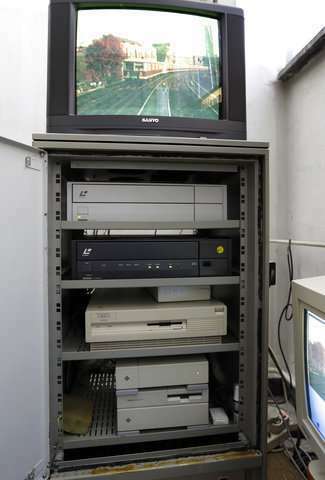 The simulator was kept in service after the fall of the Berlin Wall in 1989 and the following reunification of Germany, and it got its upgraded LaserDisc video system and Commodore computer over the next two years. It was finally taken out of service in 1996 in favor of a newer model and that might have been its end, but Tannigel took it upon himself to save the old simulator and established the museum where it's housed today. A few hundred guests visit by appointment each year, and are allowed to test their skills driving the train through the Berlin of three decades ago, watching out for signals, stopping at stations, opening and closing the doors and informing their imaginary passengers of upcoming stations and possible delays. More advanced visitors—a large number of them are retired train drivers—are given the opportunity to encounter emergency scenarios such as a loss of brake pressure or electricity. Tannigel and his fellow volunteers ask people to make donations, but there is no official charge to come and drive the simulator. But with frequent breakdowns of the Amiga computer and the LaserDisc player, Tannigel fears the time will soon come when he can't operate the simulator any more. He's been trying to raise 10,000 euros ($12,000) to add a new computer with modern software and to digitalize the historic videos for future playback. In addition to an advertising campaign to try and get more visitors to the museum, a crowdfunding page has also been started but it's far away from the goal with only about 300 euros ($355) pledged so far. Tannigel gets help from two volunteers, both studying to become train drivers, who put in countless hours helping limp the simulator along by repairing broken parts and restarting the computer endlessly. "It is a lot of fun," said 22-year-old Tobias Hirsch, one of the volunteers. "But at the same time, I also think it is really important to preserve this train history for the future."